What began as a radio experiment in 2000 quickly became the most popular weekly one-hour classical music program on public radio. 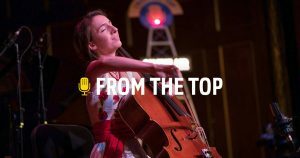 Broadcast on more than 220 stations nationwide to an audience of more than half a million listeners, From the Top celebrates the stories, talents, and character of America’s best pre-collegiate classically-trained musicians. Now approaching its 19th season, From the Top delights both seasoned classical listeners and new classical music fans. Each one-hour broadcast features five or six performances along with interviews, revealing the heart and soul behind the talent of these extraordinary young musicians. Check out the full archive of radio recordings here.